For many years I had heard the stories from many unconnected people- and they couldn’t all have been mistaken in remembering daydreams from childhood or early adulthood. Rattlechain lagoon the former marlhole that had once served the adjoining brickworks was a dangerous playground for children and skimming stones across the pool produced “sparks” when the phosphorus in the low water levelled pit reacted. I subsequently met local old boy Malcom Edge who agreed to let me reproduce an excellent piece about his recollections of the era that had earlier appeared online. I now have the documented proof which confirms this, that others would like to forget and pass off as “urban legend” . The article below is vindication of everything that Malcolm and others from the local area remember and it is proof that this lagoon was known to be “a peril to children” back in the 1950’s. It is also proof that the council at this time – Rowley Regis, were concerned about what was going on there, concerned enough to be questioning if it should be occurring there at all. The only question one can ask from this is why the bloody hell did it continue for so long after this- in fact for almost another 50 years concerning depositing the highly dangerous and toxic waste there? 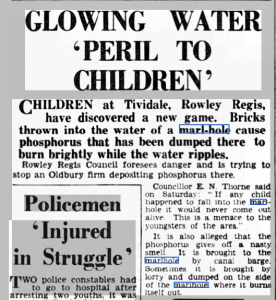 This newspaper article “Glowing water ‘peril to children’ from the 4th November 1957 Birmingham Post and Gazette confirms that Rowley Regis council were aware of this danger and expressed it as such in the public domain. There is of course no “alleged” about this fact, as what is described here would be phosphine gas and the smell of rotten eggs/garlic. Of course the adjacent sewage works at this time may have helped to mask this smell- but there is no doubt that it would have been there. Further revelations are provided in the ending statement. 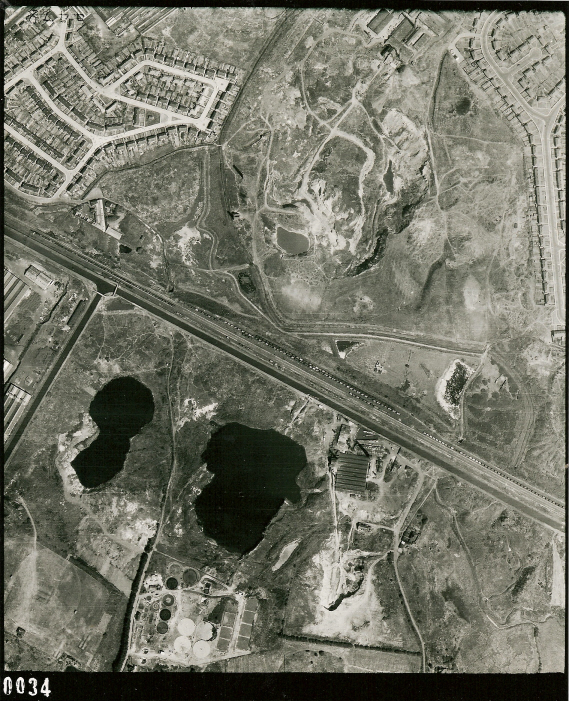 The picture above from 1950 appears to confirm that a form of service road was being used for offloading of waste from this area by road haulage. The remains of this are still present at the site today. Here’s what it looked like in 1955. The subsidiary smaller lagoon (created around 1961) from within the main single pool that was laughably known as “the clean side lagoon” by The Environment agency as well as the liars of Albright and Wilson and latterly Rhodia, is not of course in this picture as it did not exist at this point. We are aware of the phosphorus canal traffic legacy from excellent first hand primary sources from David Wilson and more latterly Roy Martin, but the revelation that it was also brought by lorry at this time indicates far more than was previously admitted by the liars of Trinity Street. This would significantly increase the amount of waste that they were dumping there- particularly barrelled wastes where they conveniently have always claimed no records existed before 1974 with site licensing. It shows no health and safety whatsoever and also shows total disregard for the safety of the public. 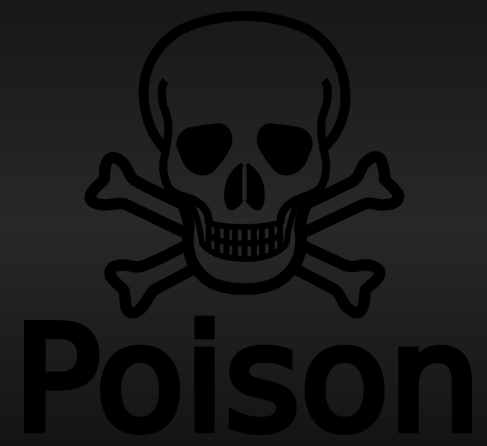 Let’s be clear here that this material and its breakdown products are dangerous to human health. The “glowing” phossy water, though obviously poisonous is less of a concern than the sediment under the water that it was hiding. I’m not sure if the councillors really got this point- and I’m certain that few have ever since! 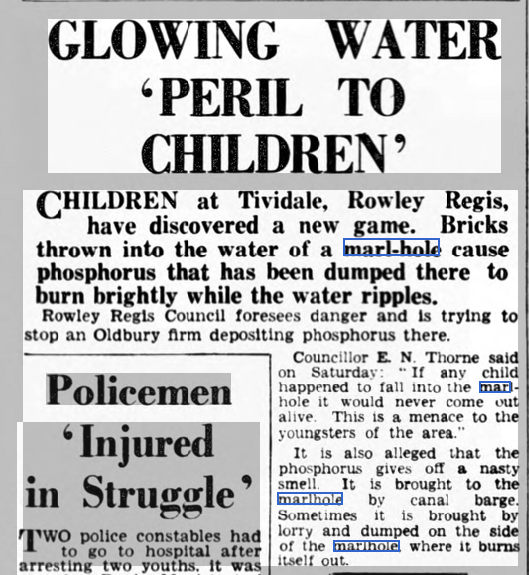 I do however note that just 5 years after this local concern of white phosphorus being dumped in an open pit in Tividale , the substance was banned for use in rat poison by Government legislation for being “cruel in it’s effect”. WHY THEN NO BAN ON DUMPING IT IN THE OPEN AIR? That it was dumped to burn itself out means that particles of white phosphorus would remain within the area. Not all phosphorus disappears when left to “burn itself out”. The staining on the bank would appear to show what was occurring at this time. Let’s also be aware that at this time Albright and Wilson had a considerable “smell” problem in Oldbury and had talked of dumping it into the North Sea. I doubt very much it ever left Rowley Regis and this marlhole. 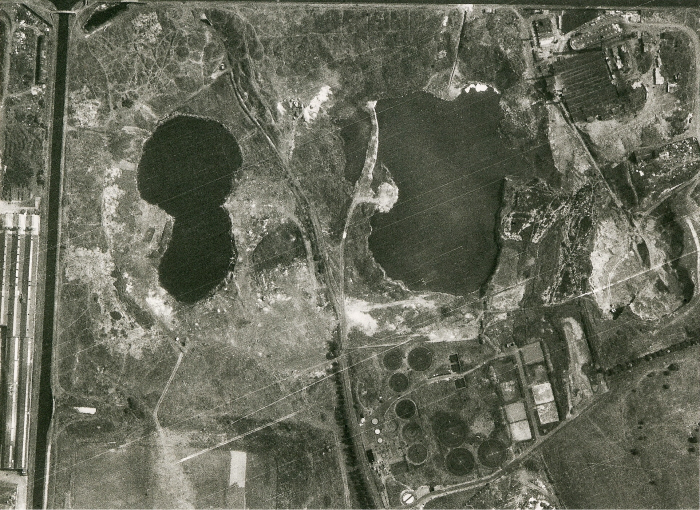 Only some 40 odd years later would systemic poisoning by white phosphorus in the unfortunate wildfowl landing in this swamp be proven , after the long denials of the company that had dumped it there- they knew full well what was to blame all along. 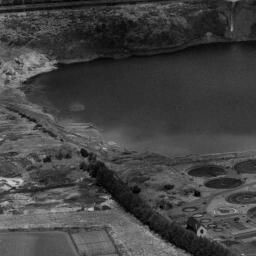 The white/yellow phosphorus peril is still all there , it’s what lies beneath rattlechain lagoon.